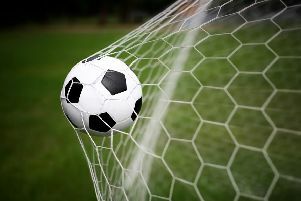 A perfect hat-trick from top scorer Scott Jones sealed victory as Chichester blew away Little Common at a blustery Oaklands Park to stay ten points clear at the top of the Southern Combination League. The hosts, on a run of 17 games unbeaten, started the brighter and took the lead after only four minutes when Axell whipped the ball in from a corner for captain Conor Cody to flick it on for Jones, who found the back of the net with a well-placed header. Jones claimed his second within 60 seconds, beating the offside trap and taking the ball around the keeper with a deft touch before calmly slotting it home with his right foot, much to the delight of the City fans. The Chi No9 might have completed his hat-trick moments later. Keeper Ryan Young found Iordache with an inch perfect pass and the Romanian picked out Jones, only for the striker to divert the ball wide of the target. The visitors, who were promoted as division one champions last season, forged a couple of half-chances but Jamie Crone’s cross was gathered safely by Young and Wes Tate dragged a shot wide on 12 minutes. Clack and Jones combined again, with the latter heading over. Jones then turned provider, setting up Iordache only for the winger to be denied by an outstanding last-ditch tackle. Just after the half hour mark Axell had a goal ruled out for offside when he got a final touch on a Clack shot, following good build up play by the versatile Rob Hutchings. City got their third before the break through Clack, who kept the ball in, after Axell’s effort was blocked, and dribbled past a defender before driving the ball under Matt Cruttwell. Who has the Sussex football fortresses? Little Common came out fighting in the second half and pulled a goal back five minutes in when Adam Smith beat Young after the ball broke kindly for him. It was the first goal Chi had conceded in four matches. Cody went on one of his mazy runs from the kick off, right through the visitors’ midfield, but was thwarted by a timely block. The resultant corner was cleared only as far as Biggs who fired narrowly wide. On 55 minutes good feet by Jones in the penalty area allowed him to get a shot off that Cruttwell managed to get something behind. Jones secured his hat-trick in some fashion, lobbing Cruttwell with a peach of a left footed shot that curled into the top corner, triggering wild celebrations on the Chi bench. Lewis Hole had a go from distance himself but the Little Common skipper’s shot blazed over the bar. Harry Williams and Kaleem Haitham were introduced in a double substitution for Jones and Biggs before Sam Ndlovu came on for Way. Clack and Iordache both had chances to kill the game. A super pass from Ben Pashley sent Clack away one on one with Cruttwell but he couldn’t steer the ball past the Commoners’ keeper. And Iordache’s touch was just too heavy after being played through by Haitham. The visitors thought they’d scored a second with ten minutes to go when Hole stabbed in the loose ball from close range after Young spilled Russell Eldridge’s free-kick. The referee’s assistant had other ideas and flagged for offside. Ndlovu then got in after good work from Clack only to pull his shot across the face of the goal. The victory was sealed in time added on after an Iordache run and cross resulted in mayhem with Ollie Weeks turning the ball into his own net. The win ensures Chichester maintain their ten point lead at the top of the SCFL premier division with six games to go. Next up for Chi is an away trip to Lingfield on Saturday. Chichester: Young, Lewis, Hutchings, Axell, Cody, Pashley, Clack, Biggs, Jones, Way, Iordache. Subs: Williams, Krumpholz, Peake, Ndlovu, Haitham.